Designed alongside current 3 times vice World champion of MTB trails, Aurélien Fotenoy, FLR's new line of flat pedal shoes and the AFS Outsole were engineered to deliver superior performance, durability and outstanding grip for extreme riders into enduro, all-mountain, downhill and dirt jumping. 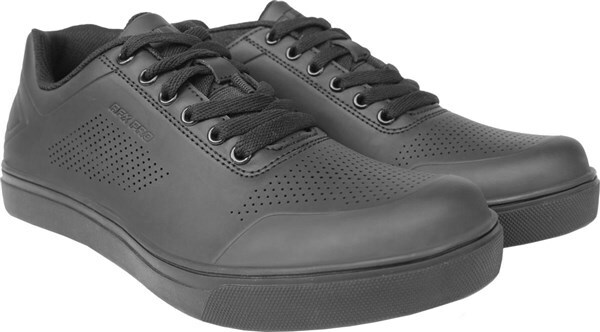 Using the latest in shoe technology, FLR have built versatile flat pedal shoes for any type of rider or need. 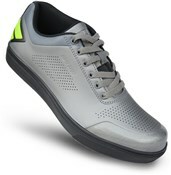 The AFS Outsole delivers ultimate riding control and grip for a flat pedal shoe. FLR used the latest technology to specially develop the STKgrip rubber compound. The sticky rubber surface maximizes pedal contact and pedal power transfer. It is built to be durable against rugged terrain and absorb trail vibrations. Its special sole design and tread pattern specifically enhances control and securely holds your foot on the pedal, yet allows for release during quick maneouvers. Push yourself to the limit. The AFX-Pro delivers worthy protection with a design ready to challenge the aggressive rider within you. FLR developed this design to shield incoming impact from any terrain. FLR took the classic flat shoe style design and added layers of protection on the shoe outside, toe box and heel for maximum impact resistance. FLR couldn't stop there. They raised the ankle cuff for additional protection from drivetrain interference. All toegether, the AFT-Pro delivers a more confident and safe riding experience in rugged technical terrain. The AFS outsole uses FLR's STKgrip rubber compound to get even stickier. Its special sole design and tread pattern securely hold your foot on the pedal, but still allow release for the ultimate control during quick maneouvers.